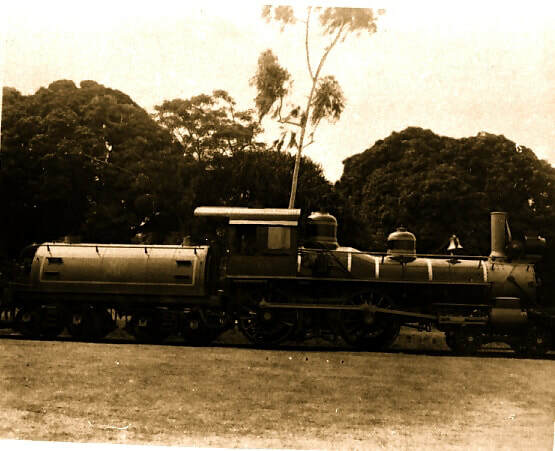 Train service to Hakalau began in 1911 and ended in 1946 when the tsunami destroyed the bridges. Train with two cars in center of Hakalau railroad trestle. Below is bridge with cart drawn by two horses. Date unknown but definitely prior to 1930. Best guess is sometime between 1911-1920. ​Photo courtesy of the Lyman Museum. 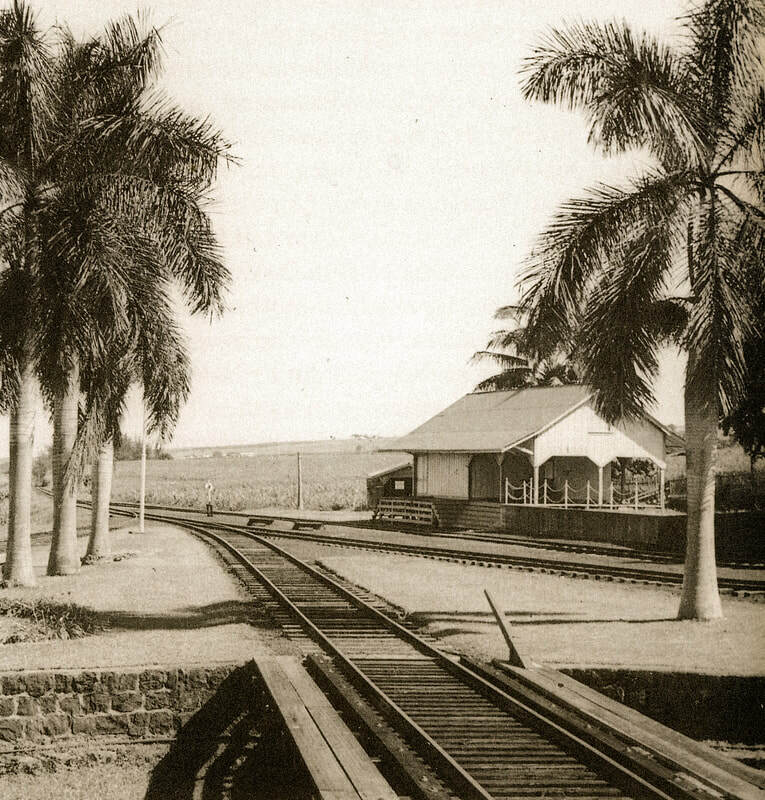 Train service to the Hakalau Plantation began in late 1911. From December 1911-1919, the train offered passenger service only. 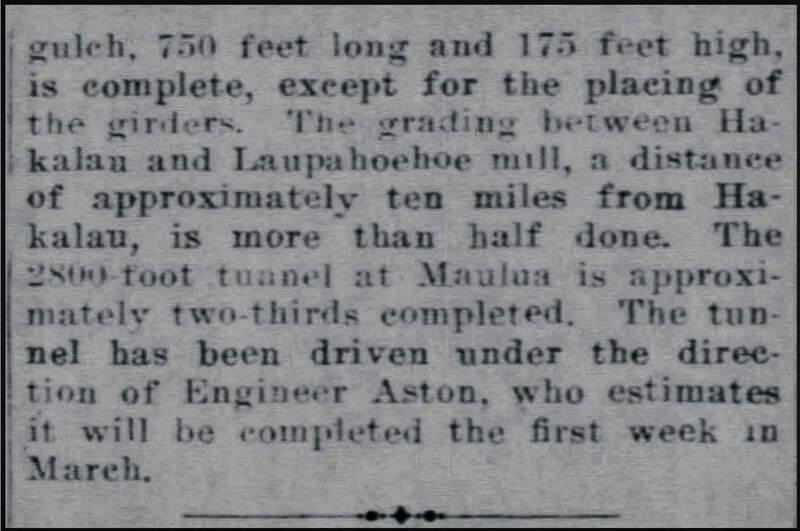 In Wailea, a tunnel was dug from Ka`ahakini River to to Kolekole River to divert Ka`ahakini River into Kolekole. 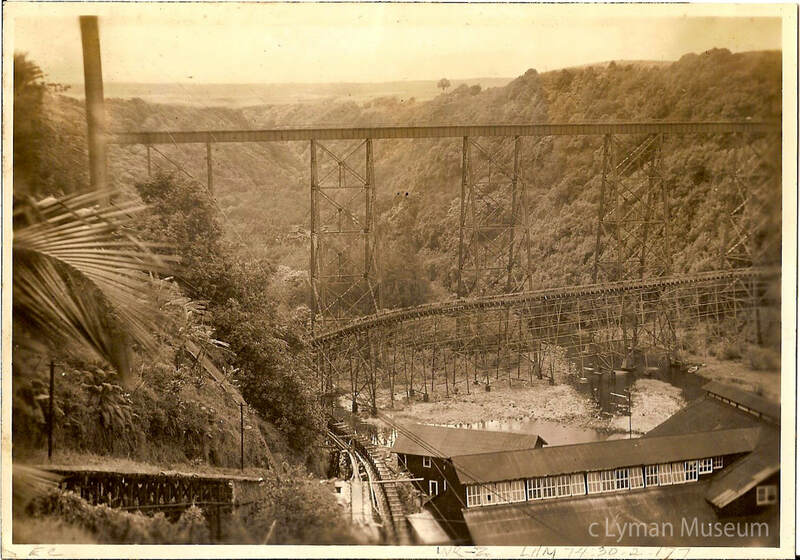 The dry side of Ka`ahakini River was then filled and the train tracks were built over it. The train crossed the bridge over the Kolekole Gulch on its way to the Mill. 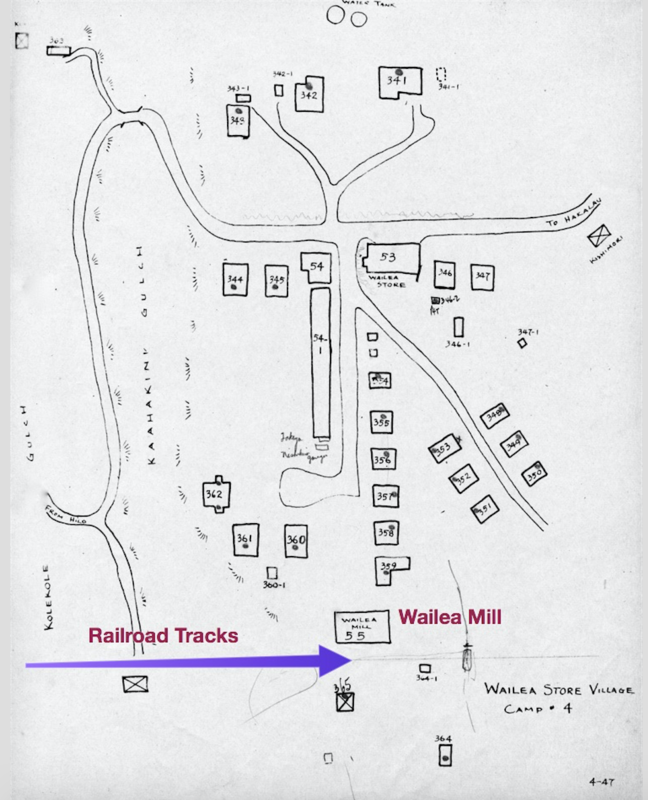 Map of Wailea Store Camp drawn in 1947, after the 1946 tsunami which destroyed the Kolekole Railroad Bridge. 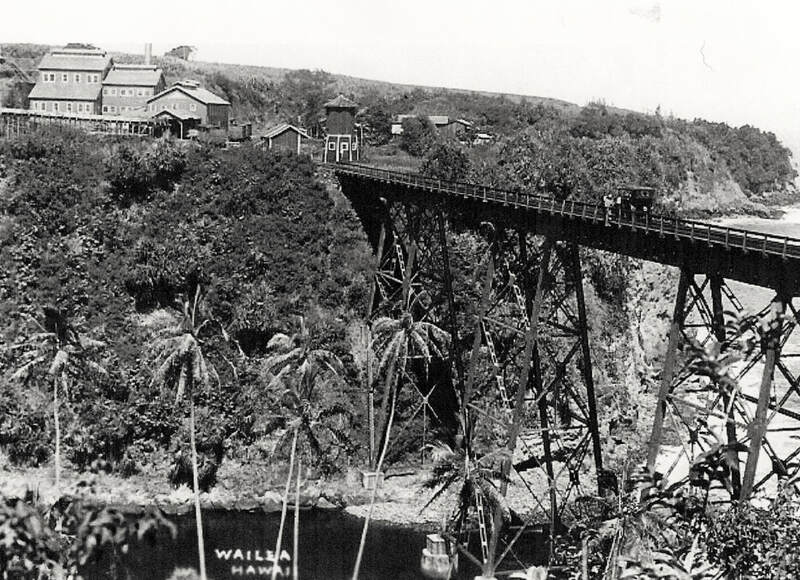 Wailea Mill, upper left; railroad bridge across Kolekole, right. Photo by Shigeharu Furusho from the Waichi Ouye Collection, courtesy of his family. Railroad tracks leading to the Wailea Mill. Photo from the Waichi Ouye Collection, courtesy of his family. Railroad tracks leading toward Kolekole Bridge. Photo courtesy of the Lyman Museum. 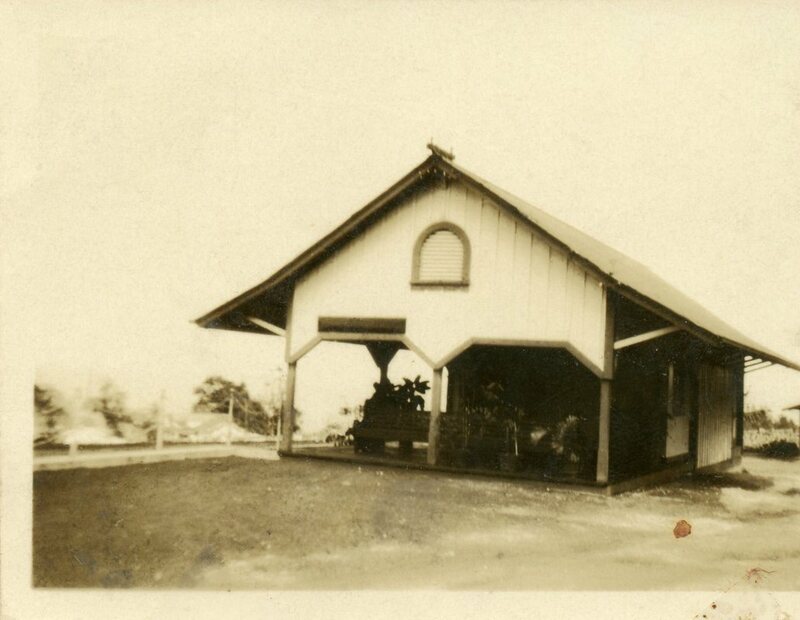 Wailea Train Station. Photo courtesy of the Lyman Museum. 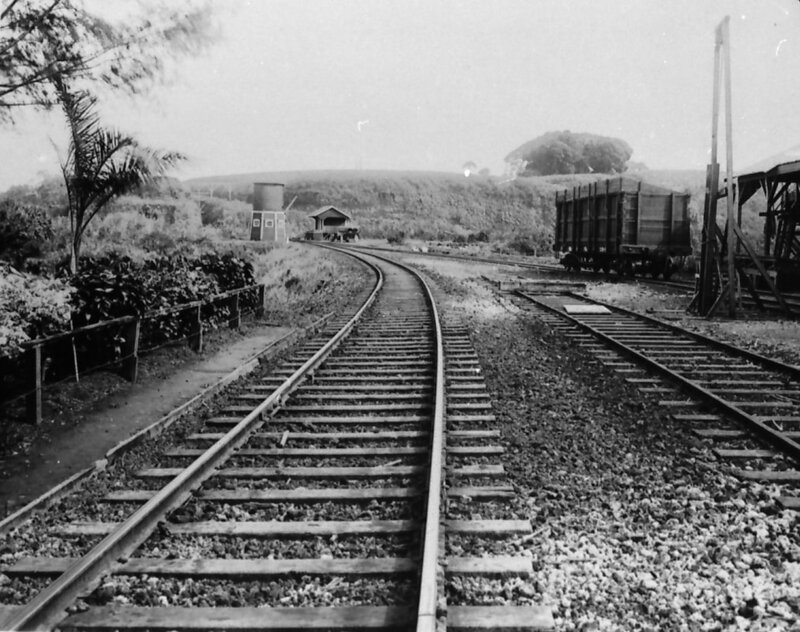 In Hakalau, the railroad tracks went through both Hakalau Upper Camp and Hakalau Lower Camp. 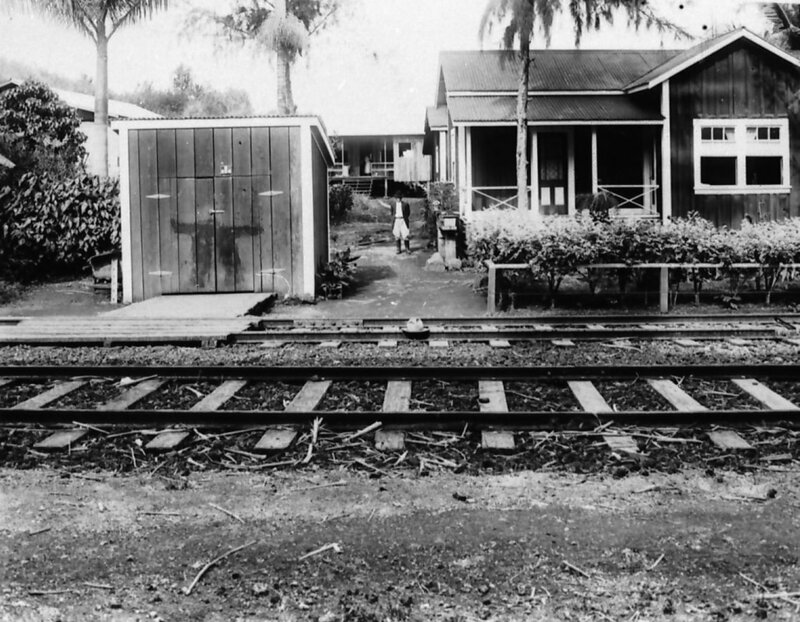 The Hakalau Railroad Station was in Hakalau Lower Camp. 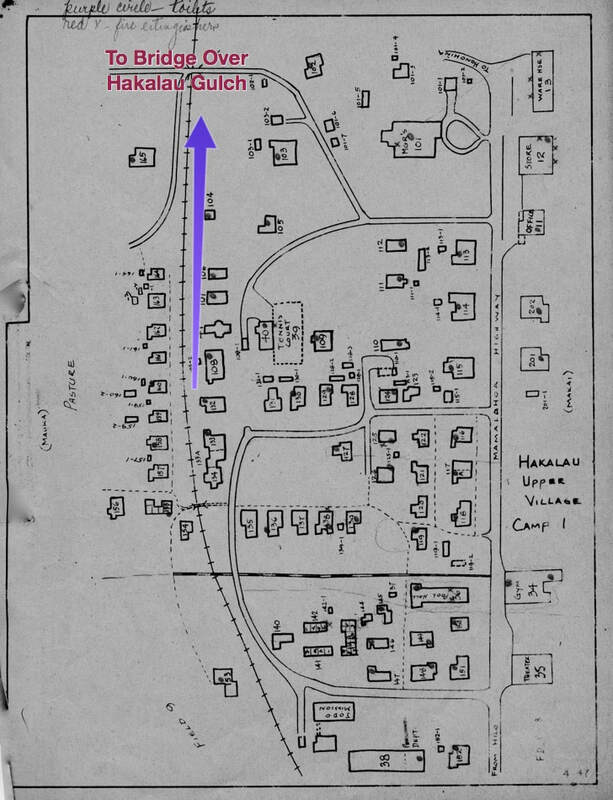 Map of the Hilo side of Halalau Lower Camp, drawn in 1947 after the tsunami ended rail service, but still showing the tracks. The trains turned around in the area near the Hakalau Station. Photo included in Sugar Town. Hakalau Railroad Station located in Hakalau Lower Camp. Photo from the Waichi Ouye Collection, courtesy of his family. 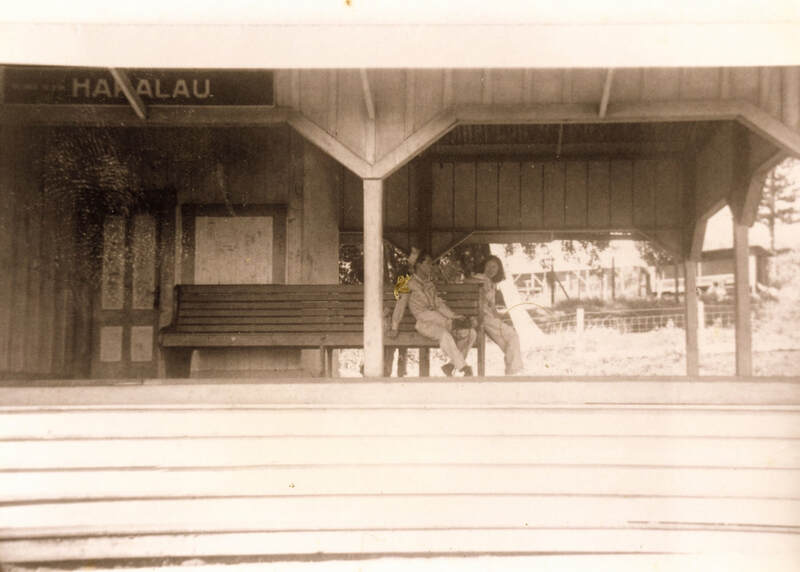 Hakalau Railroad Station during WWII. Photo from the Waichi Ouye Collection, courtesy of his family. 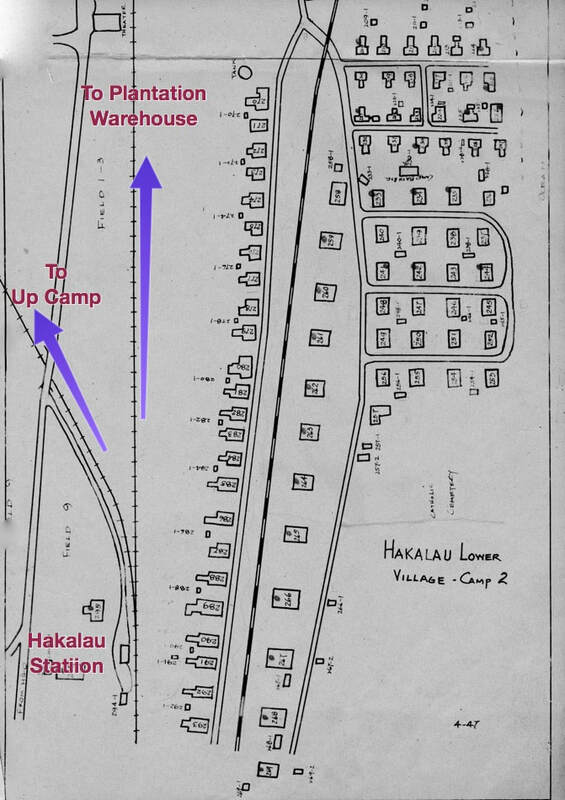 Map of the Hakalau Bay side of Hakalau Lower Camp showing the path of the tracks to the warehouse. 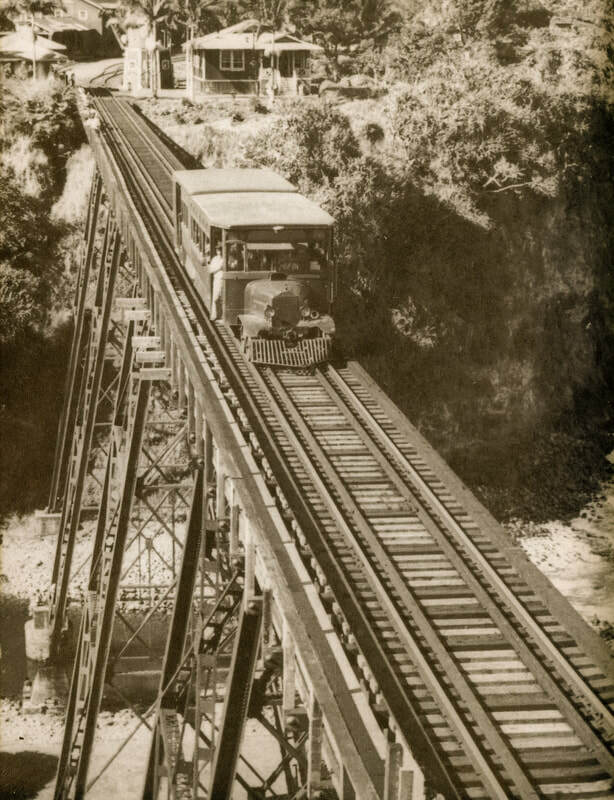 1925 photo of train crossing the Hakalau Bridge into Hakalau Upper Camp. Photo courtesy of the Lyman Museum. Map of Hakalau Upper Camp showing railroad tracks leading to the bridge over Hakalau Gulch. The map was created in 1947, after the 1946 tsunami ended train service. Note that the 10 houses on the mauka side (left side of the map) of the tracks were destroyed to make room for the Belt Highway. 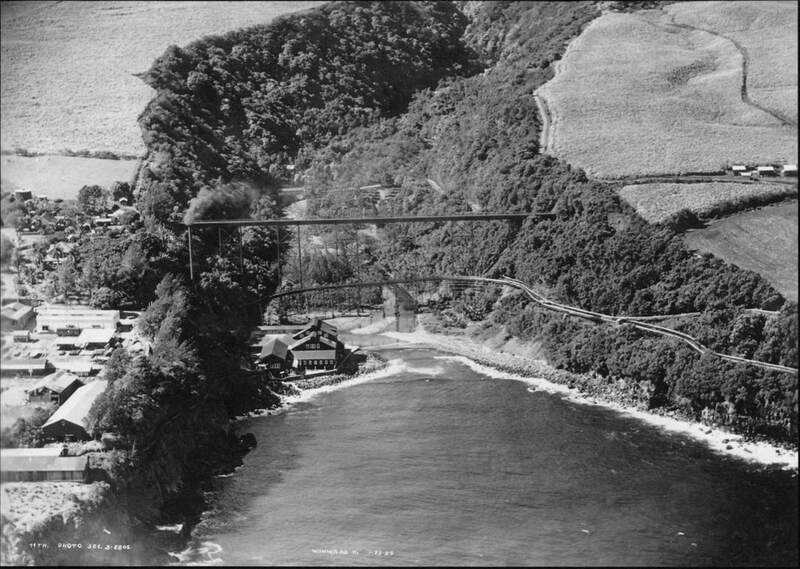 Photo prior to the 1946 tsunami showing the mill, the railroad bridge over Hakalau Gulch and the flume. Photo courtesy of the Lyman Museum. 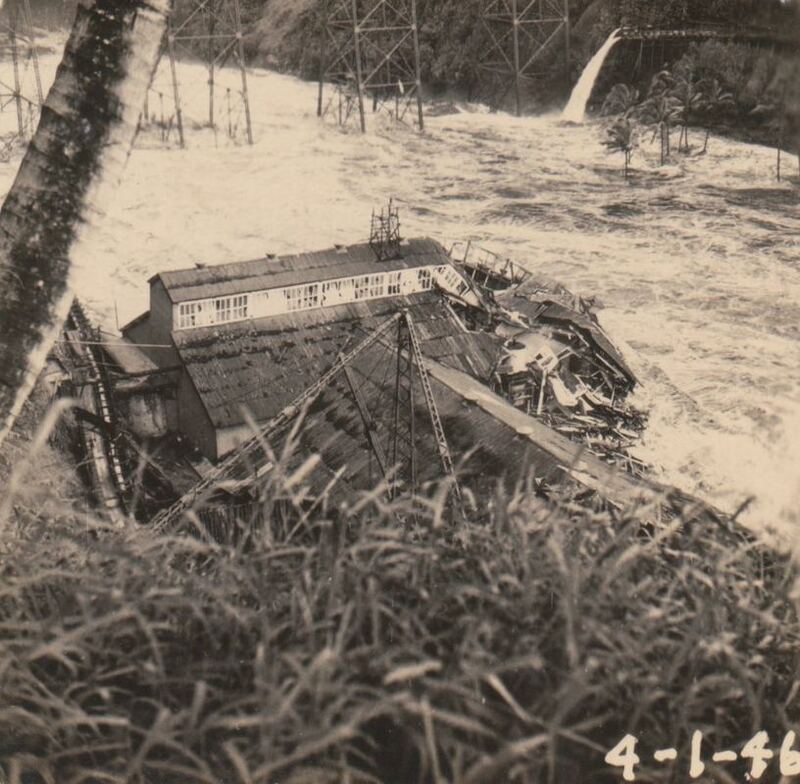 On April 1, 1946, the tsunami washed away a section of the Wailuku River railroad bridge, collapsed the center section of the Kolekole bridge, and uprooted most of the track along Bayfront. There was extensive damage to the piers and the rail line serving Hilo Harbor. The estimated cost of rebuilding was $500,000. 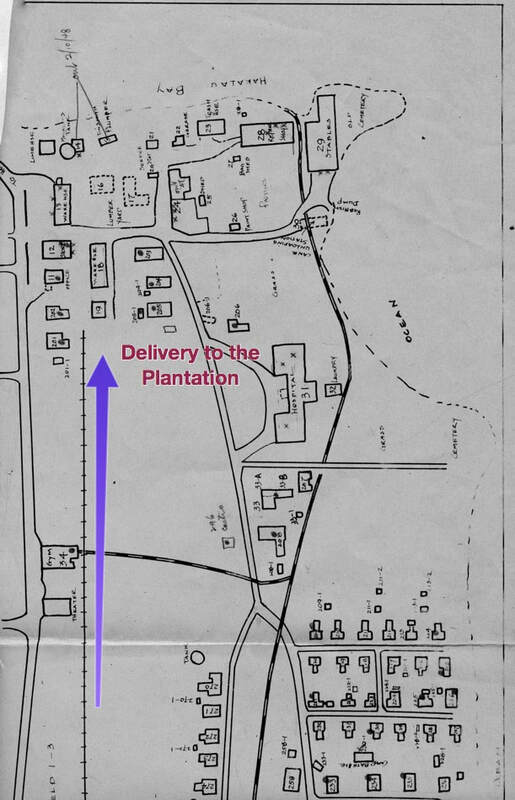 The outermost plantations, controlled by Theo H. Davies & Company, voted to restore the line; those closer to Hilo, controlled by C. Brewer & Company, voted to dissolve it. The Brewer plantations prevailed and the railroad and all its assets, including the rights-of-way, bridges, engines, cars, rails and structures, were sold to a California salvage company for $81,000. 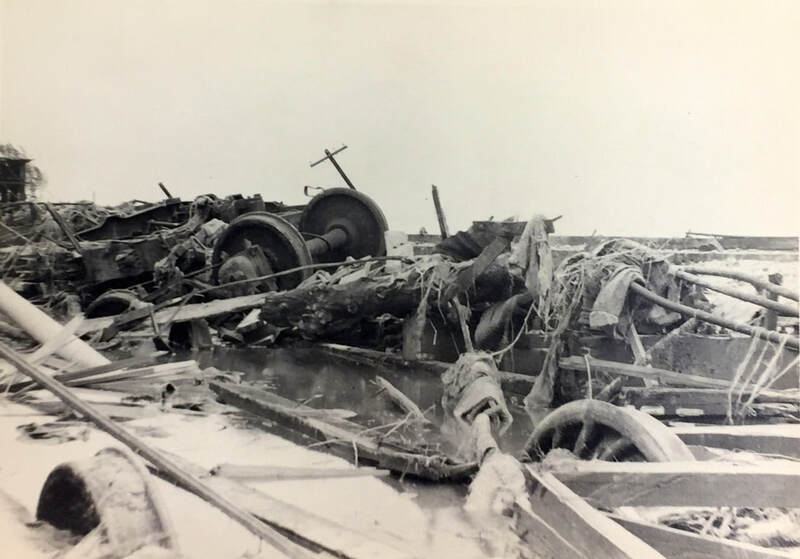 The locomotives were cut up, the wooden cars were burned, and the scrap iron was shipped back to the mainland. Because they were steel, most of the bridges were slated to be dismantled. For the plantations, the abrupt demise of the railroad meant having to transport bagged sugar by other means. Most sugar from Hamakua was trucked to Hilo Harbor, although the Hamakua Sugar Company continued to use its offshore cable landing at Honoka'a until 1948. 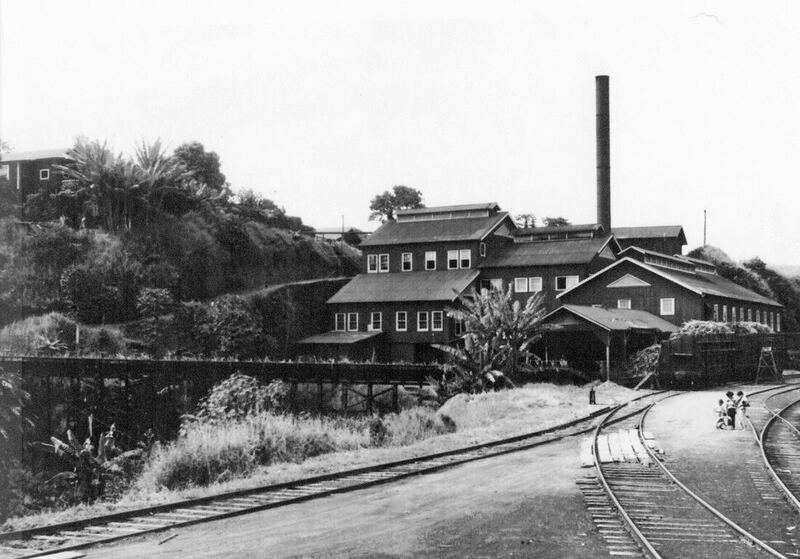 Part of the railroad was rebuilt between the Waiakea yards and Hilo Harbor, and it was operated privately for a few more years, servicing the Puna Sugar Company mill at Ola'a. Photos from Hilo provide a sense of the devastation to the railroad caused by the tsunami. The Kolekole Railroad Bridge was destroyed. 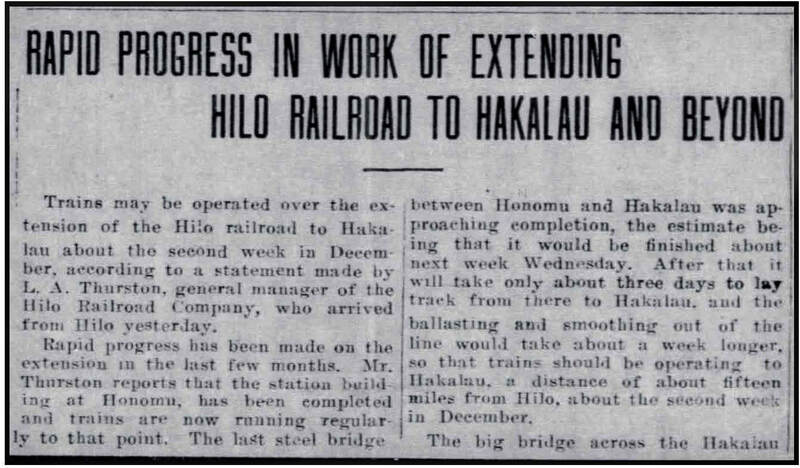 The replacement bridge was built for the Hawaii Belt Highway, not for the railroad. 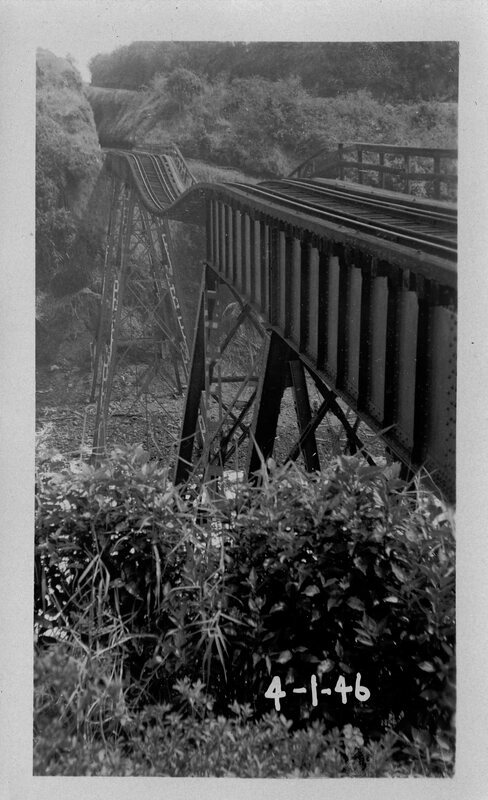 Railroad bridge over the Kolekole River, public domain photo taken prior to 1923. 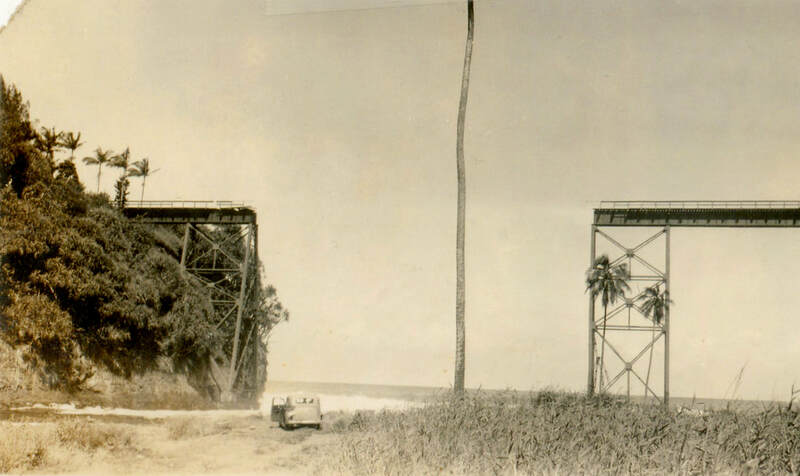 Railroad bridge over the Kolekole River on April 1, 1946 showing that the center span had been washed out. Photo from the Waichi Ouye Collection, courtesy of his family. Kolekole Railroad Bridge after the tsunami. Photo from the Waichi Ouye Collection, courtesy of his family. The railroad bridge over the Kolekole River suffered irreparable damage from the tsunami. Photo by Shigeharu Furusho from the Waichi Ouye Collection, courtesy of his family. 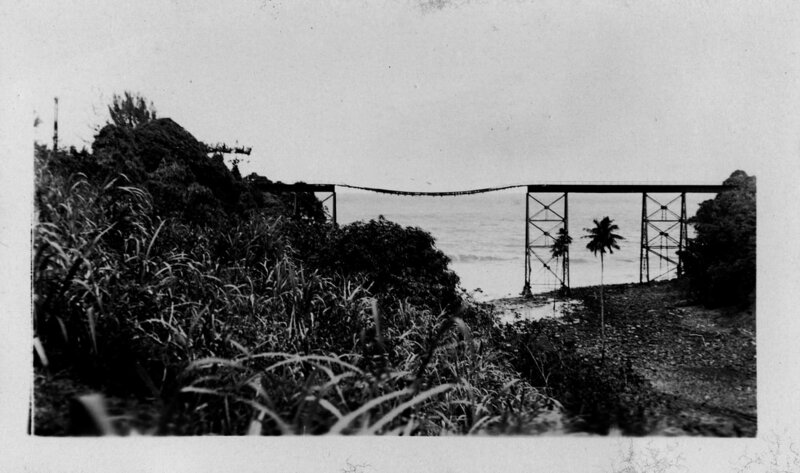 The Hakalau Railroad Bridge survived the tsunami, but the railroad ceased to exist. 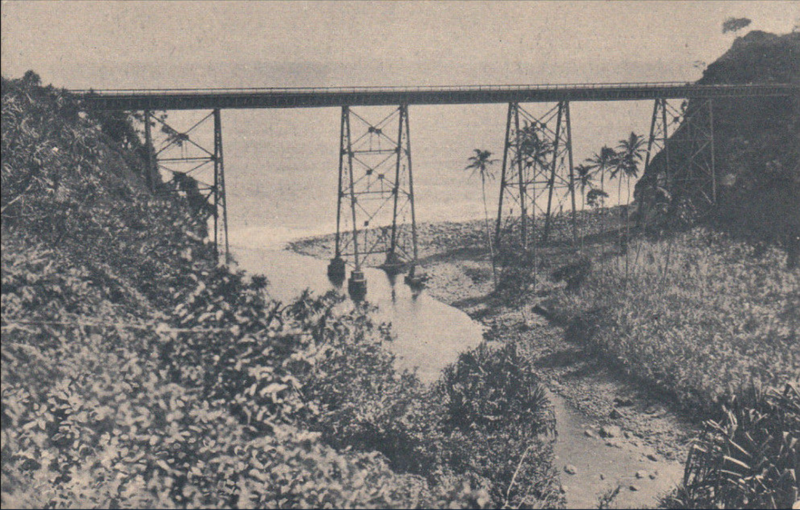 The railroad bridge became the basis for the Hawaii Belt Highway bridge over Hakalau Gulch. Of course, the Hakalau Mill was destroyed. 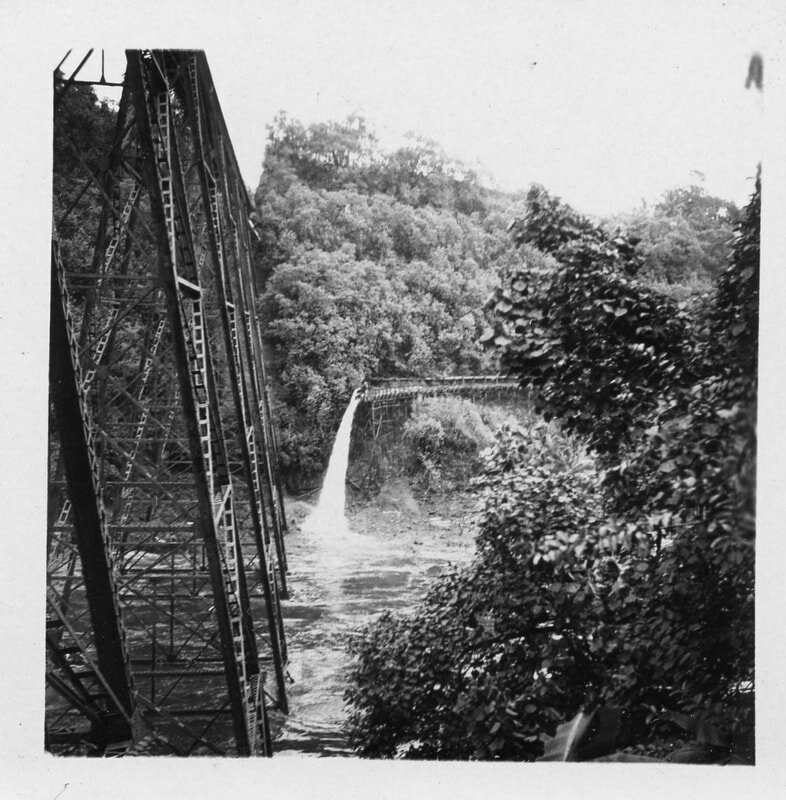 The railroad bridge over Hakalau Gulch is intact, but damage in other parts of the system doomed the railroad. The flume was destroyed. Photo by Shigeharu Furusho from the Waichi Ouye Collection, courtesy of his family. 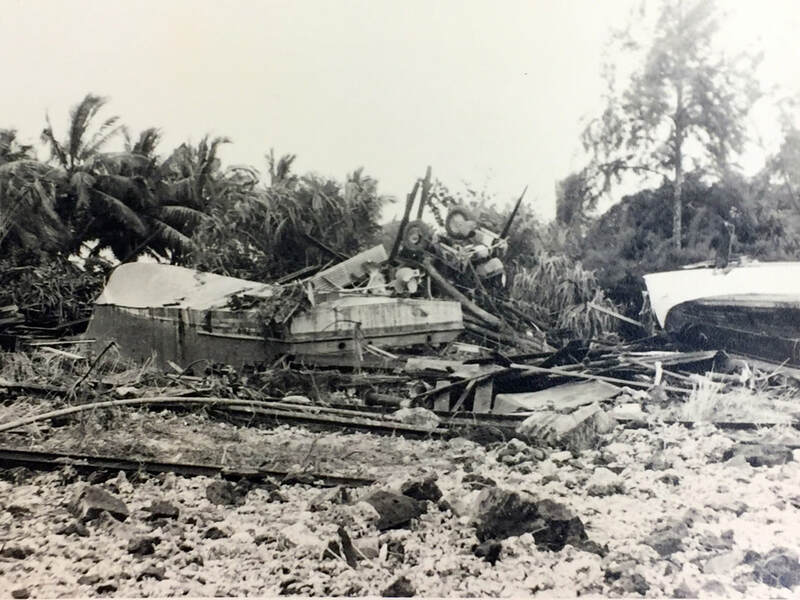 Hakalau Mill destruction, April 1, 1946. Photo by Shigeharu Furusho from the Waichi Ouye Collection, courtesy of his family.